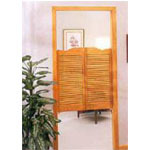 Accordion Doors for Residential or Commercial use. Cafe/Saloon Doors Stocked in Pine. Special Orders are welcome. Stocked in Pine. Customs in Spanish Cedar per quote. Can't find the size storm door you need. Click here for customs. Camouflage closets, wall safes, even private retreats. Residential or commercial from solid hardwoods.